He has the temperament of his illustrious father Shiv Chanderpaul and yesterday Tagenarine Chanderpaul demonstrated that asset with a workman-like unbeaten 79 that spanned 360 minutes and 289 balls to give Guyana the upper hand on the opening day of their third and final round Regional three-day under-19 cricket match against Trinidad and Tobago at Bourda. 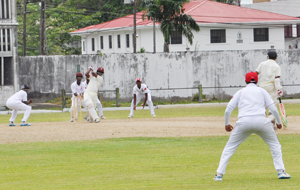 Tagenarine Chanderpaul cover drives against T&T at Bourda yesterday. The left-hander, from Unity on the East Coast of Demerara, put together 88 for the first wicket with fellow West Indies under-19 left-hander Berbician Shemron Hetymer, who hammered a swashbuckling 63 from 80 balls and 92 minutes as Guyana ended the day on 285-5 from 97 overs on a flat track and heavy outfield after they were surprisingly asked to bat by T&T. Off-spinner Samuel Roopnarine has so far taken 2-44 to lead an innocuous T&T bowling attack as Chanderpaul batted from start to finish yesterday even as Hetymer, Skipper Brain Sattaur (21), Askay Homraj (22) and Balchand Baldeo (3) all aided in their own demise with reckless and irresponsible dismissals. The Guyanese, hunting their 13th title at this level, only managed two batting points from the encounter as they could only reach 178-4 when their first 75 overs expired in a match they must win with bonus points to be assured of the title after starting as the final round leaders on the points table. Watched by a handful of spectators, which included former Guyana leg-spinner Arjune Nandu who is on holiday from Canada and a Trini who kept the gathering beyond the boundary entertained with Guitar music and melodious Calypsos in sunny conditions, the opening pair set a solid foundation for the others to build on. Hetymer stroked Akeel Seetal through the covers for an elegant boundary and whipped him forcefully through wide mid-on for three, next ball while Chanderpaul played the supporting role with level-headed batting on the heavy and lush green outfield. Hetymer, who was again explosive, thumping the ball around the ground with ferocious power and brought up his 50 with an array of audacious sweeps off leg-spinner Jessie Bootan before he again threw his wicket away when well set for substantial score to leave Guyana 88-1. Hetymer, with a century to his name in the last round, was batting sensibly when ‘out of the blue’ he played an atrocious swipe at Roopnarine to appallingly top edge a steepling offering to Seetal at point. 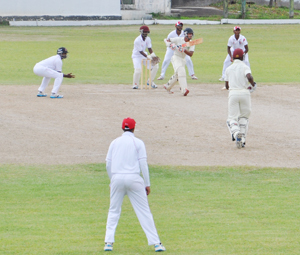 By Lunch, the Guyanese were 101-1 from 35 overs with Chanderpaul unbeaten on 29. Sattaur, dropped at mid-off on 99-1 off Brian Christmas just before the break, was on three at the Interval. Shemron Hetymer on the go against T&T at Bourda yesterday. After Lunch Chanderpaul continued to play with an abundance of common sense and delightfully cut Seetal behind point for four before caressing Bootan to the cover boundary. Sattaur made a consorted effort to bat long, while not sacrificing his ‘booming’ shots and seemed set for big score. The left-hander from East Coast hammered Seetal for a bullet-like boundary and punched him gloriously through cover for four before missing a lawless swipe at Roopnarine and was bowled for 21 from 53 balls, 73 minutes with three fours to leave on 130-2. Rose Hall Youth & Sports Club’s Askay Homraj got going with a four and an effortless six back over Roopnarine’s head and the classy Berbician was on his way while Chanderpaul greeted left-arm spinner Justin Joseph with a magnificent straight drive for four. However, Chanderpaul must have been utterly dismayed when he watched from the non-striker’s end as Homraj played a reckless dab to a delivery straight on his stumps and was bowled by Joseph at 158-3. Chanderpaul reached his second fifty of the tournament with a spanking boundary off Joseph before Balchand Basdeo stroked a ball firmly to mid-off and was needlessly run out at 166-4. Chanderpaul was dropped at long-on off Joseph on 52 with Guyana on 169-4 and the run rate dipped as Tea was taken with Guyana on 170-4 with only 69 runs being eked out in the session. Chanderpaul was 47 away from his second Regional under-19 hundred. After Tea, Chanderpaul was the glue which held the Guyana innings together and along with Sharaz Ramcharran carried the score to 203 before Seetal produced a searing yorker which crashed into the stumps of Ramcharran to end his 100-miunte and 95-ball 20 which included two fours. Paul (13) joined the well entrenched Chanderpaul and got going with a boundary off Phillip while Chanderpaul changed gear briefly and attacked the bowling as he accelerated towards the end. Today is the second day and play is scheduled to commence at 10:00hrs. Admission is free.